CropLife South Africa offers a wealth of resources, training, regulatory assistance and industry updates to its members. In addition, we are the leading industry voice for our members in matters pertaining to crop protection and public health in South Africa. Stewardship is a life cycle approach to crop protection product management to ensure safe production, transportation, storage, handling, application and use of the product, as well as the proper disposal of waste. The use of crop protection products is essential for maintaining and increasing agricultural productivity and improving farmer livelihoods in South Africa. However, this must be achieved with minimum risk to human health and the environment so as to ensure sustainable, safe and affordable food production, and therefore food security, in South Africa. What is the life-cycle approach? The life-cycle approach to stewardship is a responsible and ethical way to manage crop protection products from their discovery and development to their use and the final disposal of any waste. The overall aim of the stewardship approach is to maximise the benefits and minimise any risk, from using crop protection products. The majority of CropLife SA's supplier members develop new products, some of which may be international companies developing new chemistry or new biologicals while local companies develop new products based on existing chemistry and biologicals. Research into new combinations of existing chemicals often result in innovative pesticides that are marketed to address difficult pest issues such as invasive cactus species eradication with new combinations to replace harsh chemicals such as monosodium methylarsonate. New adjuvants are developed to make applications more effective by preventing drift, sticking active ingredients to plant surfaces and making formulations safer to handle. There are at least 4,000 field trials commissioned annually to test new products and the costs of these run into hundreds of millions of Rands. There is a significant shift towards more environmentally compatible pesticides and slowly disinvesting in highly hazardous chemistry. CropLife International’s video “Research and Development in Plant Science” shows the complex, lengthy and resource intensive R&D process from finding the right chemical compound to extensive safety testing of the final product and beyond. The video gives an insight into the huge number of people and the enormous amount of time and resources necessary today to bring even a single product to the market. The aim of R&D programmes is to develop new products, as well as improving the activity and safety of older products through improved formulation, packaging and delivery. Crop protection is one of the most research-intensive industries globally. R&D activity enables our industry to innovate, which creates jobs and contributes to economic growth while enabling even safer and more effective products to be launched. The goal of the industry’s research and development programmes is to improve the range and quality of its crop protection products. These advances include both the refinement of existing products and the development of new products and applications. Over the last five years the value of R&D expenditure on conventional chemical crop protection products and seeds and traits by the 15 leading companies in the agrochemical sector has grown at a compound annual growth rate (CAGR) of 8.2% raising the level of R&D expenditure from $4,533 million in 2007 to a total of $6,728 million in 2012 (Phillips McDougall, April 2013). All companies are working to create new products or reformulate older products so that they are biologically efficient, environmentally sound, user-friendly and economically viable. A new crop protection product takes ten years and approximately $250 million to develop (from discovery to first sales); on average around 25%, and as much as 40%, of the cost, is on researching non–target (including mammalian) toxicology, environmental fate and impacts. Further details of the plant science industry’s research and development programs for crop protection products can be found in a report available here. A brochure on Research & Development is available here. The majority of pesticides sold in South Africa are locally formulated using imported technical materials. The manufacturing and formulation plants are operated by professional scientists and engineers to deliver high quality products for the agricultural and public health sectors. Responsible manufacturing of crop protection products is an integral part of our industry’s stewardship programmes. Plant science companies aim to protect both their employees and the environment to the fullest extent possible. Manufacturing of crop protection products is done with a view to protecting both employees and the environment. The chemical industry, from which much of the modern plant science industry evolved, has always had a good safety record. Naturally, all regulatory standards are complied with, but the industry commonly takes its responsibilities further and takes part in voluntary initiatives. In addition to assuring the safety of workers, significant improvements have been made in the reduction of waste streams and carbon dioxide emissions. Through the adoption of good manufacturing practices, the industry aims to protect its neighbours, its employees and the environment. National and international standards are strictly adhered to, and international standards are adopted (ISO 14000 and 9000 in particular). We also subscribe to a number of government-sponsored voluntary standards and other industry-led schemes, in particular, Responsible Care®. Responsible Care® is a programme developed in the late 1970s by the chemical industry to assist companies in improving their environmental, health and safety performance. Participating companies are required to report on performance in a range of areas, including manufacturing. CropLife has produced a number of guidelines to reduce risk to human health and the environment through the adoption of best practices, including to prevent contamination of products (available here). CropLife SA has developed guidelines for members to acquaint themselves with the compliance issues around warehousing, storage and transportation of pesticides. Most members use the services of registered and licensed dangerous goods transport companies while others have their own fleets of certified vehicles and drivers. Pesticide stores at distribution and agent levels are built according to the SA National Standard 10206 for safe use and storage of pesticides. CropLife South Africa supports the establishment and enforcement of an appropriate regulatory environment with regard to the storage, transport and distribution of crop protection products. Voluntary stewardship initiatives complement this regulatory regime and the activities in countries are tailored to the local needs. Training programmes for retailers are actively supported. The plant science industry recommends using CRISTAL – Communicating Reliable Information Systems To Agriculture and Logistics – as a common practice to ensure traceability throughout the supply chain. See an implementation guide here and common practices for the use of barcodes and labelling of products here. For transport, guidelines cover the preparation, loading and unloading of the goods and their subsequent carriage. It is vital that there is effective planning and management of all of these functions if the possibility of an accident taking place is to be minimised. Additionally, in the event of an accident, instruction and emergency plans are in place to rapidly address the incident directly or advise those that are dealing with it. Guidelines for transport of crop protection products are available here and for warehousing here. A leaflet on Storage, Transportation and Distribution is available here. An elementary principle of effective IPM is to develop pest control strategies that take into account all relevant control tactics and locally available methods and, are sensitive to the local environment and social needs. The successful use of IPM will evaluate the potential cost-effectiveness of each alternative as well as the whole control strategy. See the infographic on IPM here. Elements that can be included in an IPM program are summarized in the figure below. IPM principles are included in industry training programmes for farmers and other stakeholders across the world. A number of training and information documents have been produced to support these programmes, including a web-based training programme aglearn.net which has modules on IPM principles, cotton IPM, rice IPM and vegetable IPM. 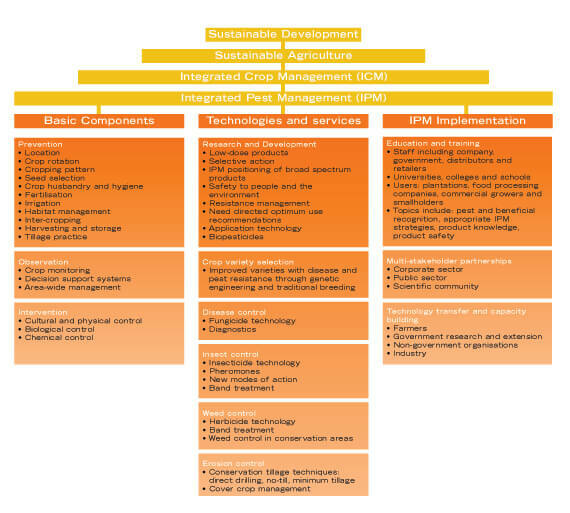 Ultimately, development and adoption of IPM strategies require mutual support and collaboration from a range of stakeholders, including government and non-government organisations, international research organisations, distributors, dealers and retailers, and producers themselves. Further information on IPM can be downloaded as a leaflet here and as a brochure here. Case studies are available here, and an IPM training manual is available here. The majority of CropLife SA's supplier and distribution members offer basic training to clients and farm workers on responsible use based on a module developed by CropLife SA. An advanced responsible use training module is also available for members to train their own staff and agrochemical agents. One of the best examples of a responsible use stewardship initiative is that of Arysta LifeScience who invested over R3 million in a training programme for small scale farmers in the Eastern Cape under the name Galela Kakuhle. A trainer and assistant are working full time in the Eastern Cape and train farmers daily. CropLife, along with its regional and national associations and leading companies, has promoted programmes providing training in the responsible use of crop protection products for more than 20 years. Training is given in the context of an Integrated Pest Management (IPM) strategy. A number of guidelines and web-based training materials have been produced. Messages in the responsible use of crop protection products reach many millions each year through various media campaigns. The plant science industry is committed to promoting practices that encourage the responsible, safe and efficient use of its products. This is undertaken within the context of promoting an Integrated Pest Management (IPM) strategy and forms an important part of the industry’s life-cycle approach to product stewardship. There are two new manuals for use of the network: the Responsible Use Manual and the Retailer Manual. The responsible and effective use of crop protection products continues to be an issue that is extremely important to the industry. We will continue to support training activities on the responsible use of crop protection products, within the framework of an Integrated Pest Management strategy. We recognise, however, that it is not possible for one group alone to reach all farmers and stakeholders and that training and extension programmes need to be undertaken in partnership with others and be aimed at achieving sustainable changes in behaviour. Collaboration with governments and their agencies, national and international organisations, NGOs, donor agencies, the agricultural distribution chain, to name but a few, is vital to the future successes in improving impact and outreach. CropLife SA has a well structured empty container management system with collectors and recyclers that have been vetted and approved as reliable and ethical operators. They assist farmers by redeeming triple-rinsed empty plastic pesticide containers and recycling the containers into other valuable plastic commodities. All CropLife SA approved service providers issue farmers with a Certificate of Adequate Disposal that export producers require for their GlobalGAP certification. More than 62% of empty containers are collected and recycled through the effective services of the 45+ CropLife SA approved collectors and recyclers. CropLife International has recognised CropLife South Africa as the one of the top ten countries in the world in terms of effective container management. CropLife SA is also in negotiations with recyclers to start collecting and recycling woven polypropylene bags that are used for some of the granular formulations and chemically treated seed. The plant science industry is taking the lead to ensure the development, use and appropriate disposal or recycling of crop protection containers are managed sustainably to protect both farmer health and the environment. Triple-rinsing empty containers is the recommended method promoted by the global CropLife network. Triple-rinsing containers with water can remove 99.99% or more of product residue. Similar results can be achieved with integrated pressure rinsing using specialised equipment incorporated in some modern spray application equipment. Containers that are rinsed as described above should be regarded as non–hazardous as described here. Click here to download the triple-rinse brochure, which communicates the three key steps of triple rinsing. CropLife South Africa encourages the use of this brochure to help educate farmers about preparing empty containers for collection and recycling. A poster is also available to purchase from CropLife SA. If you are interested, kindly contact info@croplife.co.za to place your order. Since 1990, the plant science industry has been working in a variety of countries to facilitate safe disposal projects. Facilitation has involved finding additional donor funding, organising projects, supervising operations in the field or, when appropriate, reconditioning usable stocks. Such projects typically last for 2–3 years. Between 1991 and 2003, the crop protection industry participated in over 25 multi-stakeholder projects in 20 countries, in collaboration with over 30 organisations, leading to the safe disposal of an estimated 3,000 tonnes of obsolete pesticides. From 2003, CropLife International collaborated with other partners to implement the Africa Stockpiles Program (ASP), which sought to safely dispose of obsolete pesticide stocks and associated waste across Africa. By 2018 an estimated 9,000 tonnes of obsolete pesticides will have been destroyed – see below. Following the end of the ASP, CropLife International has continued to partner with organizations such as FAO and the World Bank to eliminate obsolete stocks on a country–by–country basis. Additionally, since the 1990s, another 15,000 tonnes were collected and destroyed in OECD countries by CropLife national associations, in partnership with local governments and others. In South Africa, CropLife SA, along with some of its members, drive a waste management programme nationally to ensure producers are able to dispose of empty pesticide containers in a safe and easy manner. Agricultural production has historically endured huge losses to pests and disease, and many methods of pest control have limited life spans — pests adapt or evolve resistance, which can reduce the long–term utility of control methods. Insect and herbicide resistance management are challenges that all farmers must face — resistance is not unique to plant biotechnology, though biotech crops do bring some unique considerations which must be addressed by technology providers and farmers. Similar to all stewardship programs, resistance management practices require a diversity of tools, and must evolve and be flexible. Local agricultural conditions will help define what types of resistance management programs are needed, and they must be continuously reviewed and reconsidered. Click on the relevant sections below to read more. Fungicides are chemicals that can inhibit the growth or development of fungal pathogens. They are important tools that farmers use proactively to protect and maintain plant health, quality and yield. Certain species of fungi can become resistant to fungicides. This not only diminishes the fungicide’s long–term effectiveness but can reduce the amount of food brought to market. CropLife South Africa has a regional specialist working group, the Fungicide Resistance Action Committee (FRAC), comprising of industry experts to provide fungicide resistance management guidelines in the South African landscape. Herbicides are essential tools used by farmers to protect crop yields and quality by controlling weeds that compete with plants for nutrients, sunlight, space and water. Herbicides allow farmers to control weeds and preserve their crop’s yield and quality. If farmers rely too heavily on one type of herbicide, however, weeds can naturally adapt and become resistant. CropLife South Africa has a regional specialist technical working group, the Herbicide Resistance Action Committee (HRAC), comprising of industry experts, with the objective to promote the correct and responsible use of herbicides, to monitor new herbicide resistance cases in South Africa, to develop integrated management strategies for herbicide-resistant weeds and to provide and disseminate information about weed resistance. Insecticides are valuable tools used by farmers that can contribute to efficient food production because they control invertebrates that reduce a crop’s yield and quality. While insecticides are among the most effective tools for controlling pest populations, all farmers are challenged by the fact that every insect control method has a limited life span because pests naturally evolve and become resistant. CropLife South Africa has a regional specialist technical working group, the Insecticide Resistance Action Committee (IRAC), comprising of industry experts to facilitate communication and education on insecticide resistance and to promote the development of resistance management strategies so as to maintain efficacy and to support sustainable agriculture and improved public health in the South African landscape. Rodenticides are valuable tools used by farmers and pest management professionals to protect human and animal health from rodents, which can spread disease and destroy food crops and property. CropLife South Africa has a regional specialist working group, the Rodenticide Resistance Action Committee (RRAC), comprising of industry experts to develop an understanding of resistance and resistance management in order to maintain the effectiveness of currently available rodenticides in the South African landscape. Have you heard about Agri-Intel? Click here to access label information of all registered crop protection products in South Africa! CropLife South Africa hosts a wealth of crop protection product information. In addition to publishing regular compendiums, CropLife SA also provides its members with a database of registered agricultural remedies, as well as IP summaries of products available for integrated fruit production. One of CropLife SA’s biggest success stories, however, is the launch of Agri–Intel, arguably the most powerful tool for users within the agrochemical industry to access registered crop protection product information. Agri–Intel offers easy access to a comprehensive database of all chemical, biological and natural crop protection and public health products registered for use in South Africa including product labels, safety data sheets (SDS) and information on maximum residue limits (MRL) and withholding periods. Users are able to search for product information by active ingredient, crop or uses, targets, registration holders, registration numbers, categories or trade names. Users are also able to compare the label information of these products. Visit www.agri–Intel.com for more information. The first course of 2019 has commenced. The next course date will be announced in due course. The fee is R6 800 ex VAT per learner. Please note that the course is presented entirely online, including the assignments and examination, therefore learners must have internet access. Once a learner is registered, an invoice will be sent. If payment has been received, instructions and login details will be sent to the student on the start date of course. All the course material will be available to download once the learner has logged in. To view the modules, please download the brochure here. Die eerste kursus vir 2019 het reeds begin. Die volgende kursus datums sal so gou as moontlik bekend gemaak word. Die koste is R6 800 uit BTW per leerder. Neem asseblief kennis dat die kursus geheel en al aanlyn aangebied word, derhalwe moet die leerder toegang tot die internet hê. Sodra ‘n leerder geregistreer het, sal ‘n faktuur uitgestuur word en verdere inligting sal aan die leerder gestuur word sodra betaling ontvang is. Al die kursusmateriaal sal beskikbaar wees om af te laai wanneer die leerder inteken. Om die modules te besigtig, laai asseblief die kursusbrosjure hier af. The courses aim to achieve skills in the application of the knowledge. The emphasis is on what will the learner be able to do upon completion of the course. The new methodology strives for competency as opposed to only knowledge. ‘Competency’ is defined as knowledge, skill and attitude. contained in the previous course, but has been restructured in accordance with the unit standards guidelines and designed to optimise the ability to acquire specific competencies. The course adopts a strategy of continued competency assessment in alignment with the requirements of the SAQA training standards. Every skills programme contains a number of practical and theoretical assessments. The learner completes these assessments during the course and the summative assessment (final test) is conducted upon completion of the skills programme. This is then submitted to AVCASA as a Portfolio of Evidence. The learner has a one–year period to complete the portfolio of evidence for all the skills programmes required for the applicable course. Course material is made available to learners electronically through the AVCASA Moodle software. This software is available online and each enrolled learner will receive a username and password to access the course material. The first Aerial Application course for 2019 will take place in Bethlehem from 20 - 24 May 2019. Costs are R8 668.00 ex VAT per learner. CropLife South Africa spearheads a CPD programme aimed at distribution agents of crop protection chemicals. The programme covers topics such as technical training, business-related training, all aspects of safety, health and environment, responsible use of pesticides and oversight in responsible marketing and sales at the retail level. Once the agent has reached the required number of CPD points, he is issued with a CPD accreditation card, with a unique member number. 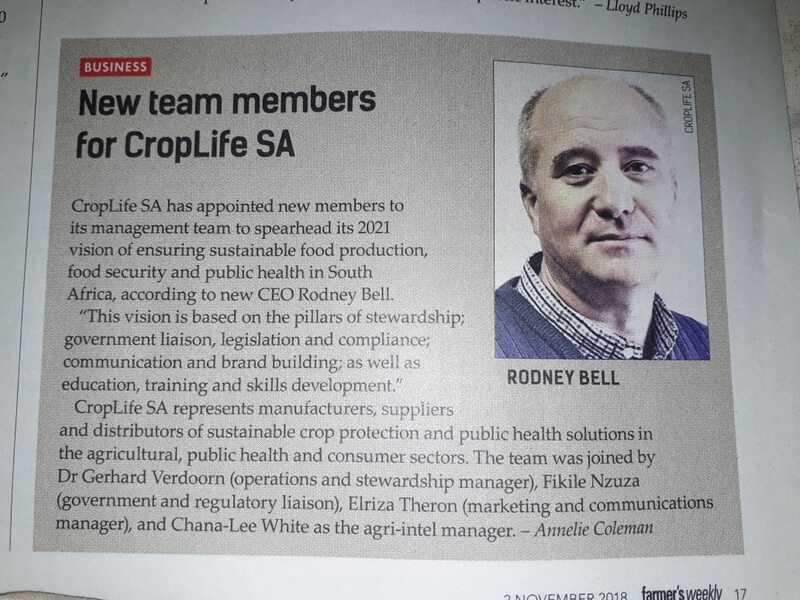 CropLife SA encourages all producers to insist on this accreditation before procuring agrochemical products. *Please note the postage fee has increased from R50,00 to R62,00 and R9,00 per extra kilogram. Kindly complete the order form and return to Susan Ramaila (susan@croplife.co.za). Fill in the form below and we’ll call you back during business hours. Please note that CropLife SA is NOT a trading company and does not purchase, sell or offer any goods or services.